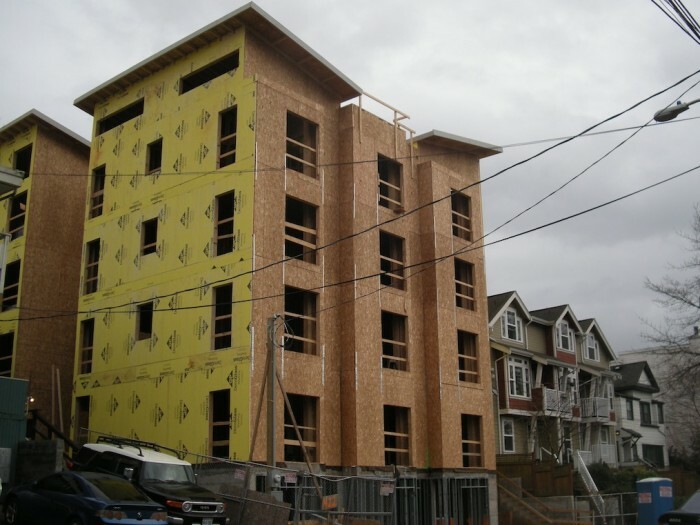 A 5 story construction at 422 11th Ave. E. in lowrise 3, residential Capitol Hill. A building this tall could not have been built in this zone before 2010, when heights were capped at 30 feet. So, neighbor, have you awoken lately to find a brand new 50′ behemoth looming over your block? If not, get ready, the bulldozer may be on its way to your block if you live in one of Seattle’s many multifamily lowrise neighborhoods. Do you feel that suddenly in Seattle’s neighborhoods are deteriorating and that the pace of tear down and development is suddenly on overdrive? It’s not your imagination. 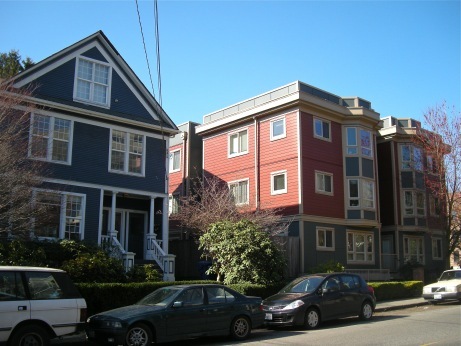 SOMETHING HAS CHANGED IN SEATTLE’S MULTI-FAMILY NEIGHBORHOODS. In 2010, the Seattle City Council changed the land use code to allow buildings as tall as 48 feet (5 stories) to be built throughout our lowrise multi-family neighborhoods (termed lowrise 3 or LR3) in growth areas. For many decades before that, Seattle’s strict zoning code limited LR3 buildings to a maximum of 30′ (3-4 stories), preserving the green, human-scale character of our urban neighborhoods and making Seattle one of America’s most livable big cities. The City Council’s intentions may have been good — things did need to be fixed, and some aspects of the new code addressed those issues. However, the increases in maximum height are destroying Seattle’s vibrant multifamily lowrise neighborhoods. No-one wants to live next to a monolithic building that towers 20 feet or more above them, casting shadows that could put them into darkness much of the year. Imagine what your life would be like if that 5 story building went up next to your 2 or 3 story apartment or home: The backyard garden you planted would be in shadow all summer. Your sunny bedroom would lose its natural light. Your favorite window would look out at a monolithic wall rather than at trees, sky, and sun. TOO MUCH CONCRETE, NOT ENOUGH TREES! The change in height and bulk resulting from the 2010 legislation has led to a developer ‘land-rush’ to construct buildings that are highly profitable but out-of-scale and out-of-character with the neighborhood. Ironically, this frenzy of out-of-character buildings threatens to destroy the very thing that makes Seattle’s lowrise neighborhoods attractive. For sale signs are going up next to the new monoliths as they push out residents who want light and air. This 122 year old Capitol Hill jewel at 18th and Denny was put on the market and purchased by a developer. It is about to be destroyed to make way for a building that is out of scale with the neighborhood, thanks to the 2010 land use code change. And historic turn-of-the century homes are being bulldozed as the incentive to replace them with highly profitable out-of-scale developments increases. What we need is a simple fix for a devastating problem that threatens to replace Seattle’s diverse lowrise neighborhoods with monotonous 5 story monoliths. WE ARE SIMPLY ASKING FOR A RETURN TO THE 30 FOOT HEIGHT LIMIT THROUGHOUT LR3 ZONES AND MORE PROTECTION AGAINST UPZONING FOR ALL ZONES. Find out why single family zones are at risk for upzoning and how our petition helps with that problem by clicking here. Increased density in LR3 zones can be achieved with a mix of diverse housing types in a way that is in keeping with the scale of the neighborhood, as with this single family house next to an apartment complex that contains 24 affordable housing units at 527 12th Ave East. Click Here to Sign the Petition to Make a Simple Fix! 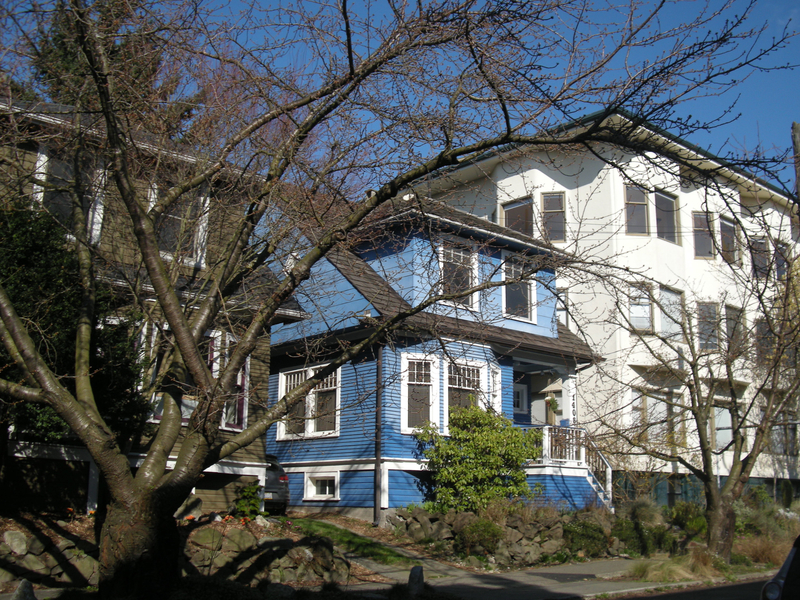 Please sign our petition and help send a message to Seattle City Council and DPD to MAKE THIS SIMPLE FIX: Reduce maximum heights to 30 feet throughout Lowrise 3. TOGETHER WE CAN FIX THIS PROBLEM: Seattle just needs to SPEAK UP NOW! Lowrise 3 consists of mix of single family homes, apartments, townhouses, and condos, and is characterized by diversity, an open airy feel, lots of sunlight and greenspace, and buildings that are on a human scale. Thanks – from your friendly young, old, bike-riding, child-rearing, hardworking, diversity-loving LR3 Seattle neighbors.